That sign has a long history, going all the way back to February of 1963, when dignitaries from all across the city came to 258 N. Fountain to dedicate the acquisition of WCT’s home. Here’s an article from the Wichita Morning Eagle on February 5, 1963, that tells the story of the dedication. 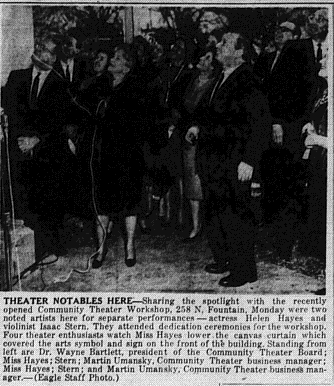 Caption: Theater Notables Here – Sharing the spotlight with the recently opened Community Theater Workshop, 258 N. Fountain, Monday were two noted artists here for separate performances – actress Helen Hayes and violinist Isaac Stern.They attended dedication ceremonies for the workshop. Four theater enthusiasts watch Miss Hayes lower the canvas curtain which covered the arts symbol and sign on the front of the building. Standing from left are Dr. Wayne Bartless, president of the Community Theater Board; Miss Hayes; Stern; and Martin Umansky, Community Theater business manager. Helen Hayes, noted actress, and Isaac Stern, renowned violin virtuoso, were attendants Monday who stole the spotlight from the bride and grooom at the wedding of Wichita and the Community Theater Workshop, 258 N. Fountain. The “wedding” included dedication ceremonies for the workshop in the building that formerly housed Temple Emanu-El. Miss Hayes, here with Maurice Evans for the Monday Community Theater presentation “A Program For Two Players,” was to speak at the dedication, with Evants scheduled to unveil metal letters and masks above the door. Evans was unable to attend after the long bus trip to Wichita and remained in the hotel resting, so Miss Hayes performed both duties. Surprise visit to the ceremonies was Isaac Stern who appeared Sunday afternoon and Monday night sponsored by the Wichita Symphony. Dr. Wayne C. Bartlett, president of the CT board, was master of ceremonies, introducing Mary Jane Teall, theater director. She introduced Mary Jabara, workshop instructor, and Miss Hayes. “This is an exciting moment in your city’s history,” Miss Hayes said. She referred to the commandment inscribed above the workshop door – “Love Thy Neighbor as Thyself” – which she said was appropriate for volunteer theater activities. “Persons working in a community theater are more apt to grow to know their neighbors and know the true spirit of neighborliness. “I am filled with admiration for all of you and I wish you godspeed with your workshop. God bless you all,” Miss Hayes concluded. The surprise appearance of Stern was announced by Mrs. Teall after she was notified of his arrival during the ceremony. “Your becoming involved, your performance in your art enterprise is the most successful single act you might perform,” he commented, stating artists enjoyed appearances in Wichita. “Make your interest in art a live part of your everyday life, rather than an adornment to your social life. It is part to be loved, enjoyed, and cherished,” the violinist said. Miss Hayes pulled a rope which lowered canvas curtains from the two signs, designed by Frank Curry in abstract metal. Beneath the sign “Community Theater Workshop” is a mask with two faces – the traditional masks of tragedy and drama. Approximately 100 attended the ceremonies. Three theater grous, the players, board, and guild members, were among those invited. Copyright Wichita Morning Eagle, 1963.